A 38-year-old Nigerian man from Edo State, Morgan Harry Osayanda was arrested in India for cheating under the pretext of coverting quoted black dollars into original dollars with the help of chemical. With his arrest, a team of Police Station Connaught Place, New Delhi District Police comprising of SI Kuldeep Yadav, Ct. Bijender No. 2405/ND and Ct. Ajeet 601/ND led by Inspr. Pankaj Malik, SHO Connaught Place, in the close supervision of Sh. Dhirendra Pratap Singh, ACP/Connaught Place, New Delhi busted a racket which cheated the persons on the pretext of converting quoted black dollars into original dollars with the help of a chemical. The team recovered 26 black paper/black dollar padding, one locker, plastic bottle containing chemical/liquid, 2 laptops, 8 mobile phones, 7 dongals, 23 SIMs, 1 pen drive along with memory card and a number of incriminating documents/articles. One Ms. Priya R/o Delhi lodged a complaint of cheating against a South African national and alleged that she has been cheated of a sum of USD 10,000/- by him for converting quoted black dollars into original dollars with the help of a chemical. A case vide FIR NO. 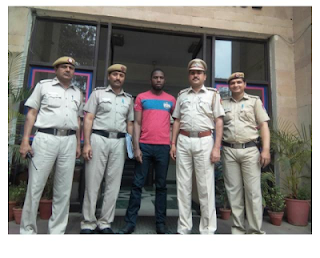 115/16, Dated 20.03.2016, U/S 420 IPC & 14 Foreigners Act, was registered at PS Connaught Place, New Delhi on her complaint and the accused was arrested, whose identity was disclosed as:- Morgan @ Harry S/o Johnson @ Osayande R/o H. No. 6, Efosa, Street off Sapele Road, Benin City, Edo State, Nigeria, Age 38 year. Accused first contact his prey and share their mobile numbers and E-mail IDs and then contact with them by giving them allurement of converting quoted black dollars into original dollars with the help of a chemical. He allured people to invest huge quoted black dollars with him into real estate business and sought original dollars from them for the purpose of converting the quoted dollars into original dollars. He would give a demo to his preys for the same. When his client/prey started trusting him, he would demand original dollars from them. Once, the cheated person gives him dollars, he never returned US dollars and rather would demand more on one pretext or the other. After a long persuasion, his preys agreed to come to see the demo as to how quoted black dollars are converted into original dollars. He convince them with the demo. In the matter, the complainant gave him USD 10,000 on the false assurance of the accused that the black dollars will be converted into original dollars with the help of a chemical and he showed her a chemical bottle. Thereafter, he pretended that the chemical has been freezed and the same will be defreeze at UK Embassy. After that, he called her and told her that the UK Embassy officials are demanding Rs. 5,10,000/- to unfreeze the chemical and requested her to transfer the amount in an account but she denied and instead planned to meet him in Connaught Place area of New Delhi where from he was apprehended. The accused passed polytechnic degree in electric engineering from his native country Nigeria in 1998. He had worked as an electrician in Nigeria before coming to India. His target in India was to cheat/deceive people by showing fake demos of converting quoted black dollars into genuine dollars with the help of a chemical. The accused along with his associates was residing in a rented house at 104/9, Upper Ground Floor, Gaushala Road, Kishangarh, Vasant Kunj, New Delhi for the last two months. They keep on changing their rented accommodation in Delhi or nearby areas so as to avoid their identities. He was residing there with a fake name in the name of Terry Lawson as a Mali National. He prepared his forged passport and visa with the help of a laptop and printer in his rented accommodation. During prolonged and sustained interrogation and systematic investigation, a team of the police station Connaught Place comprising of SI Kuldeep Yadav, Ct. Bijender No. 2405/ND and Ct. Ajeet No. 601/ND led by Inspr. Pankaj Malik, SHO Connaught Place under overall supervision of ACP/Connaught Place Sh. Dhirender Pratap Singh recovered 26 black paper/black dollar paddings, one locker/safe, plasic bottle containing chemical, 2 laptops, 8 mobile phones, 7 dongals, 23 SIMs, 1 pen drive along with memory card and a number of incriminating documents. •Nokia, Black Colour, having Vodafone SIM . •Nokia, Black Colour, Airtel 4G SIM. •Nokia, Black Colour, having SIM. Reliance, Vodafone, MTN of India and Estisate, Glo, Lyca etc. of African Country . •A Coloured printout Instruction Manual regarding Fabric Quick Automatic Solution.